There were things that were done really well, and things that were meh. I read It when it came out in 1986. Y'all, that was 30 years ago...*moment of silence to contemplate how did I get so flocking old*... What was considered horror in the mid-80s probably hardly makes a blip on most people's radar now. What I loved most about reading It, was the storytelling method. The changing perspective of the "now" (Bill grown up) and the "then" (when he was a kid). As the story progressed the two stories (now vs then) merged. They started out chapters apart and flawlessly they became intertwined until you were flipping between each perspective with each sentence. It was brillant...until the end...but that is a whole other topic. Anyway, there is no way to reproduce that effect on the screen. So the writers decided to split the two stories apart. It (2017) is just chapter one. All about the kid's battle with Pennywise. The movie ends basically with a teaser frame that says there will be a chapter two. I am assuming this will be the battle between Pennywise and the now, grown up, kids. I think this was a great decision. Even though they chopped the story into a more bite-sized version, there is still the problem of turning a book into a movie. And for some reason, Stephen King's are next to impossible to do. That too is a whole other post. Which is why I don't get my wool into a twist when screenwriters basically create a more "based on the book" screenplay. Maybe if they consulted graphic novel artists/writers they might be able to recreate the book, since they are skilled at turning a whole page of words into a few sentences in one panel. That, again, is a whole other post. Will I ever get to my review? I don't know. I'm feeling kind of chatty right now. Just kidding...here we go. There were a few scenes where they nailed the "horror" aspect. The scene when Georgie is taken was horrifying. So was the scene where Ben is in the basement of the library and his fear manifested. Beyond creepy! 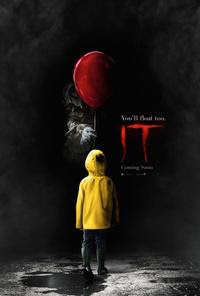 Bill Skarsgård as Pennywise was decent. It is hard to make clowns scary in today's world of zombies. I liked his voice for Pennywise. The rest was out of his hands and up to the director and special effects people. It suffered from the same problem Suicide Squad did...stick with me here on this... there were too many characters they tried to give backstory on. I never connected with any of them on a level that would matter...and when it comes to King's stories, that emotional connection is important. The only way around that would be to make a TV series so time could be devoted to character building. Or they could have cut back the number of characters, which would have stuck in the craw of those canon purists. I can usually suspend belief for fantasy movies, but with horror, I have a harder time. I mean did anyone in this town have lights in their house?! They just walked around in the dark all the time. And it got repetitive with the "there is something scary going on in that dark room/hallway, let me go check it out." If I heard a scream coming from the dark basement...I am so not going down there. The movie was longer than it needed to be. I would suggest waiting for the DVD. But some people have really liked it, so check other reviews before you decide.